Digital marketing is not only limited to big companies. Even small companies and startups are making most of it. Whether you are into a small or big business, digital marketing is helping them to create not only brand awareness but increasing more revenues as well. Same can be well narrated by one of our trainees who is working as a sales officer in the dairy company which has just used digital platforms for brand awareness. During the time, he realized how digital marketing strategies helping businesses to increase monthly sales. 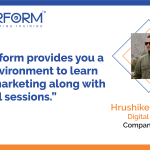 Meet Digiperformer Amit Kumar who was working as a Sales officer at the time of joining Digiperform to learn advanced level digital marketing. During the joining, he shared how much he wanted to be part of the digital marketing industry and how eagerly he was interested to learn all the possible digital marketing strategies for the business. Also, in a chit-chat, he shared why he decided to switch his marketing skills from traditional to digital and why he choose Digiperform to be his mentor. Amit: I am Amit and have completed MBA in 2011 in Marketing. I have an experience of more than 7 years in the field of sales and marketing. Being a marketing specialist, I realized this is high to learn online marketing as marketing has drifted towards online platforms more than same old traditional marketing. People are more interested to know about your business on Facebook or Google rather than seeing your pamphlets, banners or posters on the roads. Amit: As I have been saying, today the current market is more available on the internet. Whether you want to purchase clothes, machines, furniture, etc, everything is available on the internet. People (customers) will first prefer to check your business on the internet than coming to your place directly. That is why I want to help our company to promote our products online and create brand awareness as well. This pushed me to enhance my digital knowledge and get skilled according to the market. Amit: Personally, I liked the way Digiperform has created modules as per the marketing trends. They give LMS service which makes them different from other digital marketing institutes. This LMS access helps to learn and read course modules’ anytime and anywhere. Digiperform provides you 24X7 access to students which help them to revise and practice classroom sessions along with various practicals according to their convenience. Amit: Customer service of Digiperform is superb. Trainers have complete knowledge about digital marketing and they have been very supportive during my whole course journey. Amit: Yes, I would consider and recommend Digiperform as a reliable resource to learn digital marketing due to its LMS service. Amit: I would rate 8 out of 10. Amit: I want to be a good digital marketer or at the top level in the coming years. Amit: Go to Digiperform and start your career in digital marketing. Try hard to be your own boss. Amit: Digiperform is the Best Institute of Digital Marketing in Delhi. Thanks, Amit for sharing your valuable experience with us. We wish you a good luck for your future endeavors.